Aromatic plants yielding essential oils have multifarious uses from time immemorial like aromatherapy, pharmaceutical preparations, cosmetic and perfumery. Their sustainable exploitation is essential to meet the challenges of the 21st century for economic development of the society, Biodiversity and environmental conservation. 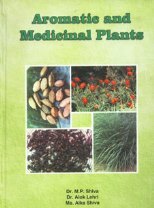 This comprehensive Book furnishes information on all aspects of about 69 commercially important plants, necessary for forest managers, policy makers, entrepreneurs and all other user groups, described under different sub-headings viz., botanical names, trade/common names, origin, habit and morphology, distribution, uses including active principles, climate and soil types, silvicultural requirements/characters, propagation and cultivation, Harvesting techniques, value addition, production, Marketing and trade, employment generation, short and long term gains, recommendations including research needs, references and resource persons/organizations. All these cover about 55 parameters according to computerized MFP Database of Centre of Minor Forest Products (COMFORPTS), Dehra Dun. The book has been written on the format of nine Ready Reckoners/Monographs, published by COMFORPTS on commercially important Non-Timber Forest Productions (NTFP) resources, which is likely to go a long way to be useful to various user groups for forging ahead in their enterprises based on essential oil yielding plants which form an important category of NTFP.